Could The Universal Checkout Cart Completely Change Online Shopping? Living in NYC, the one retail thing we miss most about the suburbs is the one-stop, everything-and-the-kitchen-sink stores where you can do your grocery shopping, pick up some new pillows, and browse the newest designer shoe collaboration — without ever having to leave the property. Online shopping does its best to replicate this process, but having to enter your billing address, credit-card info, shipping information, and create a password ("Mother's Maiden Name?") multiple times is a big pain. If there was only a way to shop the entire Internet, and just click "checkout" once. You knew where this was going, didn't you? 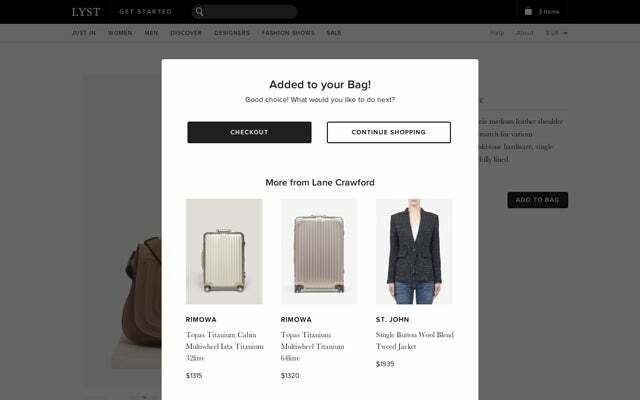 Shopping platform Lyst just launched the first universal cart this morning, and allows you to bundle all the purchases you make from your old haunts — Alexander Wang, Theory, REVOLVEClothing, and more, and make things your own with just one transaction. Efficient e-commerce isn't just good news for you — Lyst expects to see this little treat boost sales by huge numbers (an integrated checkout it rolled out eight weeks ago saw sales increases on average of 500%), which will make retailers very happy. The only person who might be worried? Your accountant. You've got a little more than eight months to figure out how you'll explain away all those new pairs of shoes.